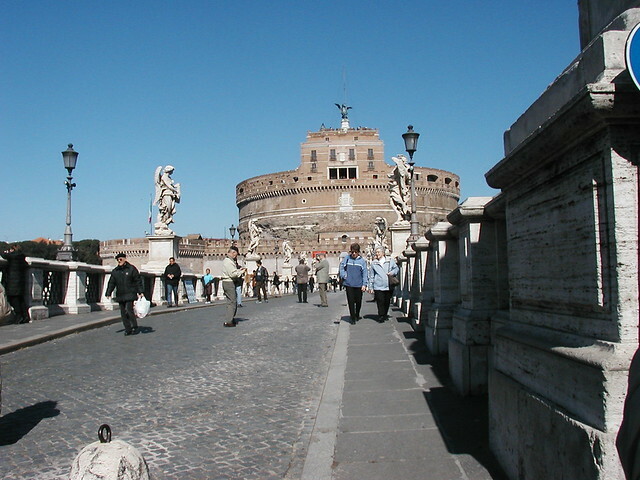 Rome, Italy was my second sojourn into Europe. Having visited Paris the year prior, I thought myself very fortunate to be going back so quickly. I had been intrigued with Rome for awhile, mostly through the lens of a movie camera. There were so many great films like “Three Coins in the fountain” and “Roman Holiday” that set the tone for my romanticized (pun intended) and lofty expectations. As wonderful as the city is, when I finally got the chance to visit this beautiful country, some things were not as I expected. Not everything one envisions matches the fantasy, but that doesn’t mean that you won’t have a fantastic time anyway. Limoncello is a very popular Italian liqueur that is made from lemons. It is produced in southern Italy in places like the Isle of Capri which is where I got my first taste of this ‘delicacy’. I realize that there are many fans of this drink, but personally, I found it to be just awful and hated it. I think what turned me off what the extremely thick and gooey viscosity of the drink that made me feel as though I was drinking lemon-flavored motor oil. Perhaps, my palate isn’t refined enough to appreciate it and you, dear reader may end up enjoying it. You can take an excavations (or Scavi) tour underneath the Vatican’s Basilica. The almost two-hour tour allows you access to the Vatican Necropolis where you can view the final resting place of St. Peter, who was martyred circa 64 and buried outside the walls of the city of Rome. Like many people who have seen The Trevi Fountain in travel photos or online, subconsciously, you get the impression that the fountain is massive and larger than the mind can conceive. However, standing in front of it in the flesh leaves a lot to be desired. You can literally step right up to it and practically kiss the statues. It felt like a bait and switch or maybe I have faulty depth perception and I’m getting ornery in my old age. You can literally walk anywhere because the city is very pedestrian friendly. The shops are in close proximity and very centrally located because I never had to use public transportation once. I did pine for the opportunity to ride one of the ubiquitous Vespas that were jetting around the city. Our visit was at the height of the gas crisis, so this idea was appealing in more ways than one. The Vatican has it’s own post office where you can mail postcards/letters and get a nifty Vatican postmark in the process. I bought a postcard and wrote a short synopsis of the day’s activities at the Vatican and mailed it back home. It’s a nice souvenir keepsake that’s meaningful yet costs very little. The last two days of my trip to Rome I was really ill. So much so, that I had to have help getting ready to catch our flight back home. I got sick, courtesy of a woman who joined us on a group tour to Capri, Sorrento, and Naples. I had the misfortune of sitting right behind her so I caught every germ that she had. I knew that I needed something serious to combat what was to come. Stat! I decided to visit one of the pharmacies that are literally on every block (or so it seems) and decided to tell the pharmacist exactly what had happened and could he recommend an over the counter elixir for me. It was difficult to discern what was what since most of the medication was written in Italian. The pharmacist actually mixed me his own concoction…something that would never happen in the states given our strict drug regulations/laws. He explained what it was and when and in what dosage that I should take it. I was happy that the laws are a bit different in Italy, even though a day had passed before I could really attack my impending sickness, I do believe that his cold medicine made my suffering a little more bearable. I’ve written about this before, but I think it bears repeating. Be wary of Romans bearing gifts! 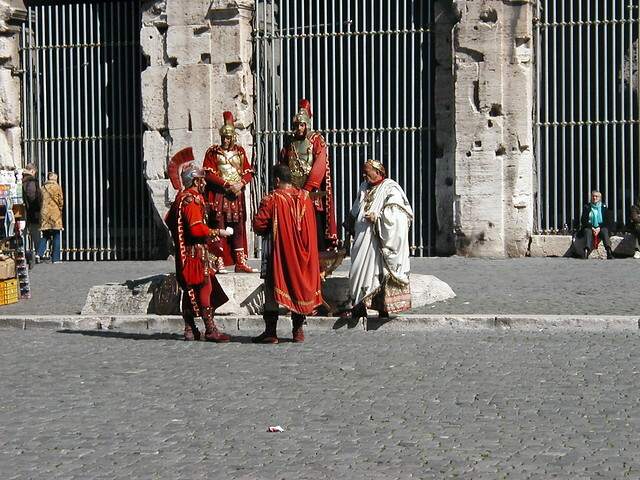 You will see these faux Roman soldiers milling around the Coliseum which is a great photo op, but it will cost you if you want to take a pic with them or even if they ‘catch’ you taking a pic of them (like this one!) one may approach you for money. Not the most pleasant experience to have, so be aware. While planning my trip to Rome, I learned about a wonderful concoction called “Gelato”. It seemed everywhere I turned, people were extolling the virtues of overdosing on gelato, the more flavors the better! The best way to describe this sensational dessert is to say it’s a cross between ice cream and sherbet. The texture is light; not as dense as ice cream and the flavors are more vibrant. It reminds you of a chunky sorbet because if you are eating a pineapple gelato, you will find chunks of pineapple in it. We have not yet visited Rome but our son has and while he enjoyed parts of the city – overall he wasn’t that keen on Rome, a lot of mixed emotions such as you experienced. I think a good term he used was disillusioned. I still look forward to visiting Rome, but would not plan to spend a great deal of time there. Ugh, I dislike it when it is forced upon you to pay for pictures. How much is it usually in this case? I think he asked for 10 euros, if that makes any difference. He was getting zero from me. Ha Ha! I had the exact same reaction to limoncello! Hated it. Way too strong for me. I’m so sorry to hear you got sick, but really interesting about the pharmacist mixing up his own medicine for you! Glad to see that I am not alone in this. Yeah, the pharmacist really came through for me in a pinch! Great post. I’ve been to Rome twice. I don’t eat ice cream in the States, but like the Gelato. I did taste the lemoncello after hearing so much about it. A very distinct taste I must say.haha!! I have not made it to Capri or the Southern Italy area yet. I will the next time I go. Yeah, I know how it is with the “fake Roman soldiers”. But they don’t have the best subway system… So you will have to walk quite a lot.